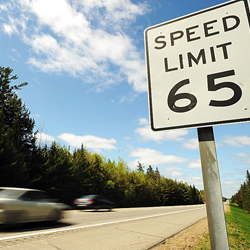 AUGUSTA, Maine — A bill to increase the speed limit on Interstate 95 between Old Town and Houlton breezed through the Legislature on Tuesday and now is headed to Gov. Paul LePage’s desk. The bill, LD 1557, would allow the state’s transportation commissioner to bump up the speed limit on Maine’s northernmost stretch of the interstate from 65 mph to 75 mph. The commissioner would have the discretion to keep the 65 mph limit on stretches of the highway where higher speeds could pose a danger, such as near the relatively few exits or in areas with high rates of vehicle-animal collisions. Supporters, including bill sponsor Rep. Alexander Willette, R-Mapleton, said the change merely reflects the reality that many drivers already exceed 65 mph on the roughly 100-mile stretch of I-95 north of Old Town. A 1999 Maine Department of Transportation study showed that most drivers already were driving up to 75 mph between Old Town and Houlton. The Maine Department of Transportation supported the change and testified that the department could absorb the loss of revenues from fewer speeding tickets. The bill passed unanimously without debate in both chambers of the Legislature. If signed by LePage, the bill would become effective 90 days after the Legislature adjourns, although the speed limit would not change until the transportation commissioner acted.